1 Bedroom Flat For Sale in Slough for £150,000. A spacious ground floor studio apartment, located within town centre and close to mainline station. 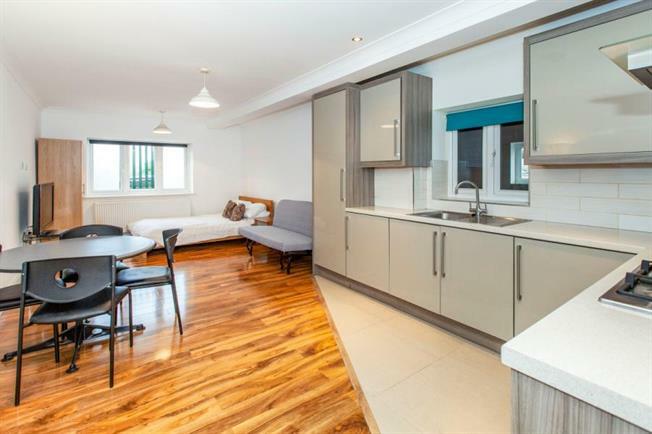 It benefits from 23ft living area, fitted kitchen, gas central heating to radiators, double glazed windows, underground secure parking, long lease and no chain. Dual aspect, radiator, telephone point, television point, laminate flooring. Side aspect, single drainer sink unit with cupboards under, wall and base units, integrated four ring gas hob with electric oven under, cooker-hood, plumbing for washing machine, space for fridge freezer. built in cupboard housing wall mounted boiler, tiled floor. Fully tiled shower cubicle, wash hand basin, low level WC, extractor fan, shaver point, heated towel rail, fully tiled.